Is this Core i7 powered rig rising out of, or falling into the flames? Last month saw YOYOtech's latest behemoth crash-land onto our test-benches in a cloud of benchmarks. It was a £5,500 rig that looked fantastic from a distance, gave great synthetic scores but up close wasn't as rosy as we'd hoped. 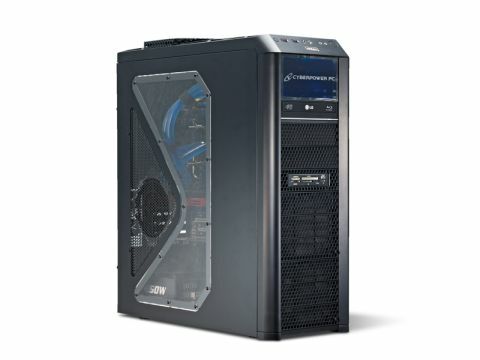 CyberPower, in the meantime, has jumped to it and is keen to show what it can do for half that; and so we have the Infinity i7 Phoenix. Quite which flames this li'l bird is rising from we're not sure, and we can promise YOYOtech the Fi7epower MLK3 hasn't been turned into ashes, so stop fretting. What we do have here is a slightly more responsible spec on a machine that will take whatever you throw at it, whether you're gaming or rendering your own response to Avatar. At nearly three large it's still a huge outlay cash-wise, but there are enough bi-annual upgraders out there looking for their next £2,500 rig that this price point stands nowhere near the ridiculous level the Fi7epower occupies. It's still got it where it counts though, with a Bloomfield Core i7 CPU running at 4GHz, more RAM than you can shake a Villazon at, a lightning-fast SSD boot drive and the fastest single-PCB GPU around. Obviously cuts have had to be made when compared with YOYOtech's monster machine, but for the most part these have been made intelligently, minimising the performance hit. The most obvious is in the choice of CPU; going for the cheaper, out-going, i7 920 saves a lot of cash and in day-to-day use you will hardly notice the difference. The storage array is where the biggest drop in performance will be felt, though plumping for only a single X25-M SSD as the boot drive will still give you an enormous boost over any HDD-based solution you're used to. The RAID pairing of the Fi7epower is incredible, but the twinning of the single drive and the massive 24GB RAM means that the desktop speed of the Phoenix is still lightning quick. You could arguably halve the RAM and save yourself some cash without impacting performance too much, especially if you went for faster memory as well. The real disappointment though is the choice of graphics card. When you're spending between £550 and £620 on the graphics the cash difference between getting two HD 5870s in CrossFire and a single dual- GPU HD 5970 is negligible. The performance difference though can be huge. This is where the Phoenix drops performance points on the Fi7epower and in a place where it really didn't need to. You're still having to cope with the vagaries of CrossFire with the HD 5970 so you might as well drop another £50-odd on the faster cards. Still, the Phoenix is a well put together rig, immaculately tidy inside and stress-tested to within an inch of its life to make sure the setup's stable when it gets to you. Customise the rig on the site with 12GB of 1,800MHz RAM and swap out the 5970 for twin 5870s and you'll save over £200 on the list price.